Glitter and Gossip alerts us that Rachael Ray appeared on Sesame Street on Wednesday. 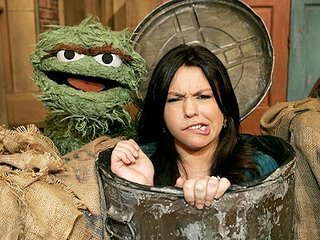 Talk-show host Rachael Ray shows us what she thinks of trading places with Oscar the Grouch during a visit to Sesame Street on Wednesday." It's funny to see her referred to as "talk-show host Rachael Ray" instead of "Food Network personality Rachael Ray." Rachael's got tons of fans that are kids, so I'm sure they are very excited to see her on the show! Ha ha! That is great! It's a great place for her to visit!